Reporting Standard maintains a local Catalog of XBRL Taxonomies located on the Internet on official locations. We will show on this post how to easily find any taxonomy on our catalog. By Standard, Taxonomy and Linkbase files published in Official locations should not change. 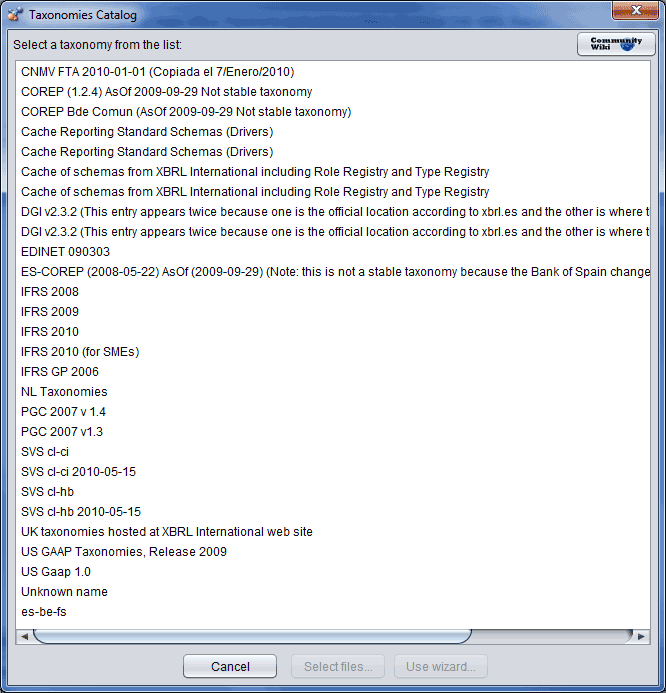 Also by standard, taxonomies are compatible with other existing official schemas from the XBRL Consortium and other taxonomies commonly used. The Taxonomy Catalog serves to accelerate loading files that refers to other files published on the Internet without having to read the files from the Internet every time. Some taxonomies in the taxonomy Catalog also has a wizard that allows our users to select the taxonomy content wihout having to worry about the official locations of the taxonomy files. Select files…: Open the Windows Explorer and allows the user to select files starting at the directory where the official files are located. Use Wizard…: Allows for selecting the taxonomy content using a high level (business) approach similar to the IFRS (ITMM). Note this is only available on some taxonomies.